Make your time in Gamestop smoother and more profitable by reading my top 5 tips for trading and buying games! With rare exception, the majority of gamers inevitably reach a point where they want something new to play. While stores like Target and Walmart carry a decent selection of titles, many gamers, including those in San Leandro, find themselves headed to the Gamestops on East 14th Street and Bayfair to get their hands on the newest releases. With a large stock of used and new games to choose from, and the ability to trade in used titles and accessories towards purchases, it’s little wonder that so many of us (yes, this writer included) make our way to Gamestop. Factor in the chance to snag obscure and collectible games that the two big box stores don’t carry and the allure becomes even clearer. However, as many of you have also come to know, the good things Gamestop has to offer are perhaps more accurately described as the silver lining to a big, gray cloud of denied trades, low trade-in values and a deluge of interrogative banter mainly revolving around the fact that you have yet to buy that oh-so-important loyalty card. Here are 5 tips to make your transactions smoother and save you the headache of going home to find those AV cables lying under your bed. Your PS2 has been sitting around collecting dust and acting as a pseudo-coaster for many moons now and ten dollars off of Madden 12 sounds great to you. So, you unplug your former best friend in the world and lug it over to Gamestop for a snappy trade-in. All of a sudden the guy behind the counter tells you they can’t take it because you didn’t bring a controller and the cords are missing. Unfortunately, Gamestop isn’t going to take any systems that don’t have the power and audio/video cords, as well as a working controller. For a lot of you out there who forget to bring the cords and controller in for a system trade, it’s just a simple oversight. However, for many others, it’s a case of not having those items to begin with, which makes matters infinitely trickier. Don’t worry, though, there’s still hope if you are missing these vital components. Most Gamestops carry a lot of the cords and controllers for the systems you want to trade in (PS2, XBox 360, Wii, and so on), which means you can purchase anything the system might be missing and make it trade-in ready. However, this can be a double-edged sword; if you’re not careful, you might end up spending more on replacing missing pieces than what the system is actually worth. Keep that in mind when you’re rushing to get your Gamecube traded in-or any other system! Though a Gamestop worker will jabber endlessly about how great the Powerup Pro card is every time you go in, its true value ultimately boils down to your own personal buying habits. If you predominantly buy used games, and especially if you buy them frequently, the Powerup Pro card is a must. You save 10% off the cost of any used game or accessory purchase. That adds up quickly. Spending $45 for a used game? That’s $4.50 in your pocket. The asking price for the card, which provides you with one year of service is $14.99, which means all you need is a handful of purchases to cover what you spent on the card and then start making money off of it. Even if you’re just making smaller purchases, let’s say, $10-15 games, it all adds up in the course of a year and really saves you some cash. This is really beneficial to parents who are trying to squeeze game purchases into a tight budget. When Christmas comes, this card will be invaluable to you. However, if you buy sporadically (at best), and especially if said purchases are of new games and not used, I would avoid getting the card. The main advantage of becoming a Powerup Pro member is the 10% discount on used games and accessories; if you’re spending $14.99 on the card and your total savings for the year purchasing used games from Gamestop isn’t equal to or greater than $150, then the card is going to be useless to you. Keep in mind, there are a couple caveats to consider here that might sway you even if you are an infrequent buyer or don’t buy used games. One, the card comes with a year subscription to Game Informer, a monthly videogame news and reviews magazine. The magazine is of a decent quality and if you enjoy this sort of thing, it’s a cheap way to get hold of a copy every month. Two, you do earn points when you make transactions whether the product is new or used. The points add up over the course of a year, and if you get enough you’re eligible for free stuff and coupons from Gamestop. Definitely weigh all this in your mind when deciding whether or not to placate your sales associate’s pleas to sign up. While 10% isn’t the greatest discount in the world, it’s in effect every time you walk into a Gamestop for a whole year and can add up in the long-run. One more thing; the card boosts trade-in values by 10%, which is another significent thing to consider if you’re someone who doesn’t hold onto their games forever. There are four types of games to trade in; the evergreen title, the hot-right-now title, the sports title, and everything else. An evergreen title is something that is always in demand no matter how much time goes by. A game like New Super Mario Bros. Wii or Call of Duty are perfect examples of this. Gamestop is going to charge top dollar for these games even if they’re already over 3 years old. Hot-right-now is exactly what it sounds like; whatever is newest and most exciting to people at the moment. These titles have the potential to become evergreen, but odds are they won’t and you should make the most of them while you can. I’d say a game like Ultimate Marvel Vs. Capcom would fit nicely here. Sports titles are games like Madden and NBA2K. The sports games, just so you know, have the biggest drop of value over the course of their existence. You will get pennies to the dollar the longer you wait to trade them in. Then there’s everything else. Movie tie-ins, party games, obscure titles without much hype or fanfair, these are all games that will fall to the side and not net you very much when it comes time to trade them in. But here’s the thing- on average, despite everything I just described, you’ll be lucky to net $7-10 per game on a good day. Unless it’s a Mario title or a Pokemon title, in which case you might get $10-11 bucks-those games are the best to trade in because the demand for them is epic. If you go in with Call of Duty: Black Ops, Resident Evil, and Pokemon (insert color here), you’re probably going to snag $25-30 tops, even with the loyalty card. What you need to do is keep your ear to the ground for promotions Gamestop is running at the moment. Often, Gamestop will have sales where they bump all trade-in values by 10%, which is especially cool when you have the loyalty card, because your regular 10% boost for trade-ins will stack with the promotion and get you 20%. That’s a significant amount to add to your trade-in totals, people. Gamestop sometimes runs trade-in promotions where the amount you get for your games will be boosted if they’re made towards the purchase of a specific title. For example, if Black Ops 2 is coming out, Gamestop might offer an extra 15% for your trades if you put the money you get towards the purchase of that game. 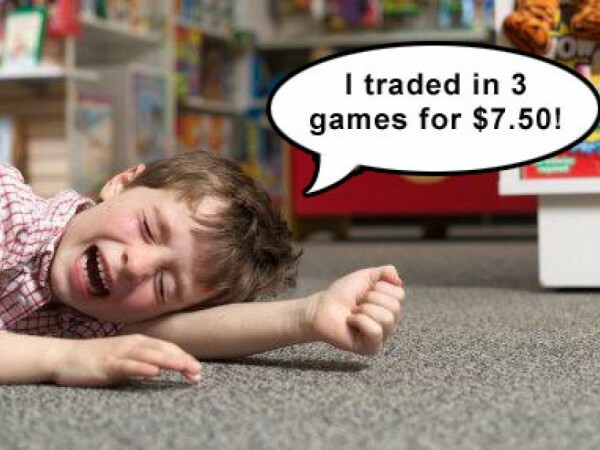 Basically, go into a Gamestop knowing you’re not going to get too much for your trades. But if you wait for the right promotions and sales, you can boost that amount by a decent chunk. Remember those trade promotions I just said to keep your eyes open for? Some of them are terrible and will outright rob you. Here’s a great example of this; last year Gamestop did a promotion for trading in NCAA to get Madden 12. Both games went for $59.99 new, and were released within a month of each other. However, Gamestop’s “deal” was that if you traded your barely-out-of-the-box NCAA towards the purchase of Madden, you’d get $30. Which means you basically spent $90 on Madden and rented NCAA for $30. It was absolute madness, but people did it anyway, because they wanted that $30 trade-in. Don’t forget those “everything else” games, either. If you bought something that was just released and paid $60 for it, but a week later Gamestop is only giving you $10 for it, try selling it to a friend, instead. I’m sure a buddy will be happy to give you $30 bucks as opposed to giving Gamestop $50-55 (yes, the same title they would give you $10 for, they will turn around and sell for that much, because it’s a new release). Be cautious and be smart when you trade! Wondering why you only got $5 for your copy of Modern Warfare 3? Maybe it’s because the disc looked like someone backed over it with a monster truck. If your stuff looks like junk, you’re going to get junk prices for it. Think about it, you might be getting rid of it, but Gamestop is going to be re-selling it to someone else right after you walk out the door. No one wants to buy something that looks like it’s seconds from breaking into a million pieces. This should just be a rule of thumb for anything you own, but treat your stuff with some respect. Keep it as scratch-free as possible, keep it clean, and you’ll get the maximum trade-in value from Gamestop. I’ve seen so many kids who show up with a dusty little mound of discs and controllers, caked in filth and scraped up like a cage fighter, looking positively bewildered because they’re getting even less than usual for their trades and even having some things turned away. Rule of thumb is don’t try to trade something if it doesn’t look like anything you would buy for yourself.